If you�re looking for an ideal holiday get-away then head to the Old Stables � Yr Hen Stabl � located in the heart of the rolling Welsh countryside. Here you will find luxurious, contemporary holiday accommodation for up to six people in a recently renovated 19th century barn. Style - A neutral and contemporary feel with many original features that gives you a �home away from home� experience. 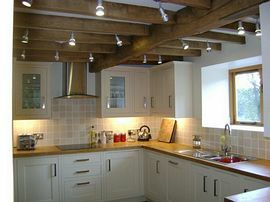 The barn has been recently renovated to a very high standard and an energy saving light and heating system installed. Underfloor heating is provided so you can stroll around the property bare foot whatever the time of year! Downstairs� You will enter the property through a double glazed oak door that lets streams of light into an oak floored spacious hallway, complete with chaise lounge to relax and read that much anticipated holiday book. 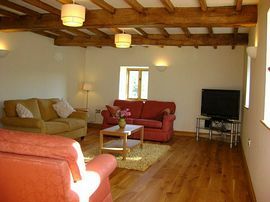 From the hallway, you will be led into a large sitting room with original oak beams, three comfy sofas and a 42� HD television with freeSat and DVD player. 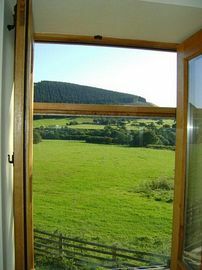 This room has three windows with magnificent views over the beautiful mid Wales countryside. The modern cream �Shaker-style� kitchen has all you could possibly need to make your stay complete � a dishwasher, washer/dryer, microwave, fridge/freezer, double oven and a ceramic hob. From the kitchen, an open entrance leads you into a real bonus room � a beautiful sun room with oak dining table and two cane sofas. This room is half glazed with slate roof and patio doors opening onto an outdoor seated area with barbecue. A ground floor toilet and cloak room is provided. Upstairs � The master bedroom is a king-sized double with large window and Juliet balcony. This bedroom has an en-suite bathroom. There is also a light-filled twin room, family tiled bathroom with bath and shower over and a children�s bunk room with full-sized bunks so ideal for small children and teenagers. All rooms upstairs have sloped ceilings but don�t worry there will be no ducking heads as there is plenty of headroom. The detached barn is situated on a working family farm, with the original stone farmhouse located behind the property but totally private. There is plenty of parking for up to three cars in front of the property and a large grass area for the children to run around. Relax on the outdoor furniture and enjoy the peace and quiet. If you�re lucky, watch out for the Red Kite which is often found flying over the property. Bike storage can be arranged on request. There is also a highchair and cot available if needed. The property is located in Mid Wales just outside the village of Carno and is an ideal base for exploring mid and north Wales. It is located approximately 13 miles from the market town of Newtown, 19 miles from Machynlleth, 37 miles from the seaside town of Aberystwyth and 29 miles from Aberdyfi. The Snowdonia National Park is also only a 50 mile drive. From London, the property can be reached by car within 3.5 to 4 hour and the nearest train station is at Caersws, four miles from the barn. Open all year with special long weekend rates available in low season.